Silicone sealant. We don’t really think about it, but it’s actually an essential part of getting your bathroom ready for use – especially when you are installing a new shower. One big question remains, however, are you using silicone sealant or caulk to get the job done? The first thing we actually address in this guide is what the difference between these two materials is, so that should clear a lot up for you before you go and decide which one you need for the task at hand. Using silicone sealant in your bathroom is essential, because it is waterproof and will ensure that the walls and tiles remain protected from water damage. It’s easy to get a little lost within this topic though, especially with the different types and techniques you have to consider. This is why we are here – to help you learn more about silicone sealant and caulk, as well as the best way to use them in order to get the best results. In order to help you find the best silicone sealant, we have put this guide together, compiling all of the relevant silicone sealant reviews in one place so that you can find the one that will bring your bathroom to life. What’s the Difference Between Caulk and Silicone? How Long is it Best to Leave Silicone Sealant to Dry? What’s the Best Silicone Sealant That Can Dry Underwater? Where is the Best Place to Buy Silicone Sealant? What is the Best Price I Can Pay for Silicone? How Long After Silicone Can I Shower? How Do You Reseal a Shower Floor? This is a common question, and one that I needed clarified the first time I fixed up my bathroom. What is the difference between caulk and silicone? After all, they look practically the same and seem like they would be used for the same tasks. Here’s a quick rundown of what each does best. This is the fastest drier out of the two, and it is a lot quicker than silicone. It is not very tolerant to movement, and it cannot come into contact with water, but removing it is pretty easy when it needs to be replaced, and it can be painted over if you fancy changing the colours. It’s perfect for skirting filling, and dries a lot harder than silicone. This is highly elastic and will stick to pretty much every surface, and this also means that it will be able to work with moving joints without breaking. It is water resistant, which is why it is so good for rooms with a lot of moisture, and some will even prevent the growth of mould. It’s really durable and resilient to temperature changes, as well as coming in different colours. There are three main time periods for drying silicone sealant, and it all depends on factors like the temperature and quality. A lower quality sealant will only take an hour to dry, which is fantastic but may also result in crumbling and cracking over time. A good quality sealant will take an average of 24 hours in a warm room, but if the area is cold, then you can expect to wait closer to 36 hours for it to finish drying. The thing is, every silicone is different and may need a special touch in order to get it off so that you can replace it. Certain brands are removed easier when used with the same silicone remover that they manufacture, whereas others can be taken off using a little elbow grease and a silicone removal tool. Of course, if you don’t know who made your silicone, the best option is trial and error until you can get rid of it completely. A good place to start? Take a Stanley knife and cut the silicone away. After a good deal of research, it should be noted that while there are plenty of brands out there that manufacture coloured silicone, Mapei is certainly at the top of the list. They have around 30 different colours available for you to buy, giving you a strong variety. However, if you are more interested in a simple ivory or clear silicone, we have a great little selection for you to flick through below. I hear your gasps, and honestly, I was surprised that a silicone like this exists. While they can work very well, there are times where you might find that it fails to do the job – it’s not a guarantee. There are a couple of these on the market, but the one leading the field is Plumber’s Gold by EverBuild; a brand that we take a further look at later on in this guide. It’s a product that is more readily available in your local hardware or bathroom store than online, however. There are only two places you can really buy silicone sealant – online and your local hardware store. Of course, you should always make sure the website you are using for the purchase is reliable if you decide to buy online in order to avoid disappointment. Always go for a brand that you trust, and make sure you follow the instructions on the packaging when you go to apply it. Honestly, there is no one price that can be deemed the best when it comes to silicone, because it all depends on the quality and the brand. There are some really cheap brands out there, but they may not be able to offer the durability that more expensive ones offer. While price is not always a solid indicator with regards to the quality, it can be quite a good guide to follow, and the expression ‘you get what you pay for’ often comes into play. The ideal temperature for the use of silicone sealant is 18C. This means that the temperature is not cold enough to prolong the drying time for the sealant, but it’s not so warm that the silicone will end up forming a skin that you will need to wipe away once it has dried. In this section, you will find a list of the silicone sealant removers that we feel are best for the job, giving you a good selection to flick through so that you can determine which one is going to get the work done with minimal effort and the best results. UniBond is a leading brand within the sealant industry, and so you know you are getting something touch and reliable when you go with them. If you are in search of a sealant that can fight off mould as well as leave your bathroom nice and watertight, this is the one for you. One of the first features to make a note of is the fact that this sealant comes in a long canister with a nozzle on the end, helping you to apply it accurately and without too much hassle. While the one linked here is white, there is also the choice to buy a different one that is ivory instead – so you can select the one that best suits your design vision for your shower. It can be used on all tiled areas, and it has even been created with properties that help to keep mould and mildew away once it has dried and can get to work. It’s also tough and durable, reducing the risk of crumbling and damage over time. It only takes a day to fully dry, and the high levels of adhesion mean that its sanitary aspects will last a lot longer than most. Some customers have noted that the nozzle can make the application process quite slow. This silicone sealant is really affordable, and great for doing work in your bathroom or kitchen. The waterproof seal that it provides is ideal for your shower, and while there are some who feel the included nozzle makes the process a slow one, it is better to take your time and do it right than rush and ruin the whole thing. It’s an excellent option to go for, and one that will be totally worth it once it dries. EverBuild is another superb brand, and one with a great history of reliability. So, if you are still looking to find the perfect sealant for you, this might be a good chance for you to have a browse through the reviews below and see if this one fits the bill. This silicone sealant actually comes in several different colours and styles, giving you more freedom when it comes to choosing which one is going to work best for your home. It also conforms to all of the required safety standards, and will dry quickly to provide a robust and waterproof seal for your shower walls. Plus, it remains permanently flexible, part of what makes the rubber seal so tight. It can be used on practically any surface as well, whether it is tile, wood, or a PVC area. This makes it quite a versatile form of sealant. The fact that it is clear makes it really versatile in terms of appearance, and it is also resistant to dirt so that it will stay cleaner for longer. It is also a professional grade sealant, offering you some added peace of mind when you go to use it. Some customers have found that this particular sealant is a little expensive for what it is. This silicone sealant may come at a higher price than others on the market, but you are paying for the fantastic quality, as well as the fact that it is professional grade, and one used by builders. The clear finish makes it really versatile, although there are plenty of other options out there for you. It’s tough and resilient, as well as made to last, just some of the features that show this is one of the best choices on the market. Another one from UniBond, this particular silicone sealant is unique and fantastic in the way it works. So, if you are searching for something that is a little different, and even able to perform a wider range of tasks, this could be just what you need. Have a quick read below. This sealant has a really neat design in that you simply squeeze the tube and apply it to the area, a little like Tippex, and the finished results are incredibly clean. It’s not just simple to apply though; it can also be placed on top of existing sealant to fills holes and make the whole thing more secure. There is even an integrated smoothing tool so that you can get the best possible finish. It has a protective later on the top that prevents mould, even working to kill it so that it does not become infested, and it also means there is less cleaning and maintenance work to do for you. The strong adhesion means that you don’t need to worry about crumbling or cracking, and it will dry within a day. Each tube also contains enough sealant for a standard bathroom to be covered. Some customers have noted that it can be a little tricky to use and get used to at first. This silicone sealant does come at a great price, and one that you should find quite easy to slip into your budget. While it may not always be the easiest tool to use, if you take your time and are patient, you should be on track in no time at all. It works to prevent and kill mould, meaning that the silicone will be easy to clean and maintain. Overall, it is easy to overcome any challenges, and it has the ability to do more than one job in your bathroom. Here are some further models of silicone sealant for you to look at, just in case the ones above do not quite meet your requirements. The great thing about this particular form of silicone is that it’s not just for use in bathrooms and kitchens, but it is also completely safe to use with marine and aquatic life. So, it can be used in all areas of your home without worry. The sealant itself is also high-module, meaning that when it dries, it is incredibly rigid and robust once it dries. It is also able to handle extreme temperatures without affecting the consistency of the silicone, and there is also a nozzle included so that the application of the sealant can be made quickly and easily. 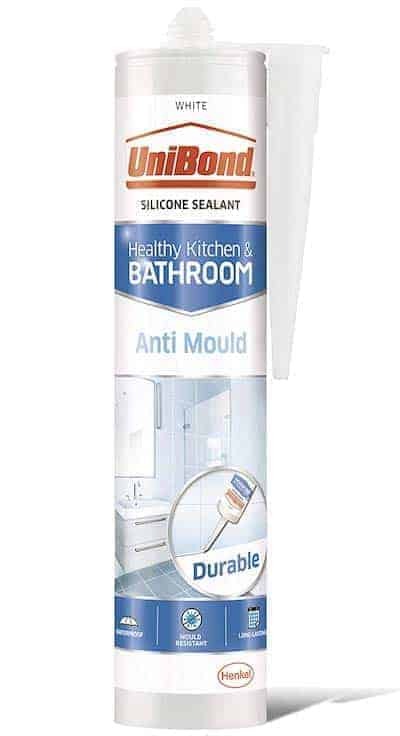 Another one from EverBuild, this silicone sealant can be purchased as a single canister or in a multi-pack – ideal for large bathrooms, or for projects that require it to be used in multiple areas of the home. It is completely waterproof as well, which is what makes it ideal for using in your shower, and it promises to create a tight seal that will leave you feeling relaxed when you next step inside. It remains permanently flexible, so it can be used around bathtubs and other fixtures in your bathroom. It’s also incredibly cheap, which is great if you are searching for a good bargain. This can depend on the temperature of the bathroom when you apply the silicone sealant and leave it to set. In a room that is cold, it will be around 36 hours before you can use the shower as that is the length of time it will set. Warm rooms will only take 24 hours, as the temperature helps it to set faster. These are the good quality silicones on the market, and you can buy some that will only take an hour, but these tend to be less durable over time. This is not a difficult task, and it can be achieved quite quickly as well if you set the time aside. All you need to do is follow the simple instructions below, and you’ll be a pro in no time at all. #1 Scrape any loose caulk from between the tiles. You can use a screwdriver to do this if needed, or even a dull blade if there is some really stuck stuff. You should also remove any grout haze from between the lines as well, and then wipe it all down with a soft cloth. #2 Using a mixture of warm water and the cleaning product of your choice, take the time to wash your floor thoroughly with a clean cloth. Then, after rinsing it, leave the entire floor to dry completely before you move on. It should be noted that this can take as long as five days. This is an essential stage, because no further work can be done until it is dry. #3 Grab some grout sealer and apply it over the grout, creating a waterproof seal that will protect your floor and tiles. It is also resistant to oil and chemicals. After this, you can apply a silicone sealant over the seams between the tiles. The thickest layer should be where the wall meets the floor for extra resistance to water – especially within a shower. #4 If there is any excess sealant left after the work, you can use a knife or a cloth to remove it and ensure that the finish is nice and clean. After that, you can leave the floor to dry for a minimum to 12 hours before resuming normal use of the bathroom. Hopefully, this guide has been able to help you discover the best silicone sealant for you, and the silicone sealant reviews have ensured that you are able to find exactly what you need in order the carry out the work and get your shower completely ready for action. Within this guide, we have done more than present you with a few options when buying your silicone sealant – we have created something extensive that will answer all of your questions, and even give you a few handy tricks and tips for when you start the work. The brands we have chosen are all reputable and trustworthy, and there is a whole range of prices so that you are able to find something that slips into your budget perfectly. We know you will find what you are looking for. What did you think of our silicone sealant guide? Are there any that you would have liked to see or recommended? We love hearing from you, so make sure to leave us a message in the comments below.